change your mind – and your life! It is yours to read risk-free! We’ve all had bad days. Days when we’re down in the dumps. That’s normal. That’s life. But when the cloud of sadness lingers for weeks or months, that’s depression. It’s not normal. And it has no place in your life. For too many people—men and women of all ages—depression is an unrelenting thief, robbing them of their happiness and isolating them from friends and family. Depression is the single biggest cause of disability worldwide and nearly one in eight people will suffer a major depression sometime during their lifetime. But all is not bleak. Far from it. Depression is increasingly recognized as a medical illness. And more importantly, it is a treatable medical illness. The symptoms of depression can be diagnosed and its causes can be addressed. In short, depression can be effectively and successfully controlled and conquered. In this new report from Massachusetts General Hospital you will discover how advances in the study and treatment of depression are, quite literally, restoring hope. You’ll learn about the internal and external factors responsible for a major depression, the common and uncommon symptoms, and how doctors diagnose depression. Plus, you’ll find out about cheering breakthroughs in antidepressant medicines, the role of interpersonal therapies, and which alternative treatments hold surprising promise. No matter what the illness, our first question is “why me?” Why have I been singled out? What did I do wrong? When it comes to depression, the answer is you did nothing wrong. 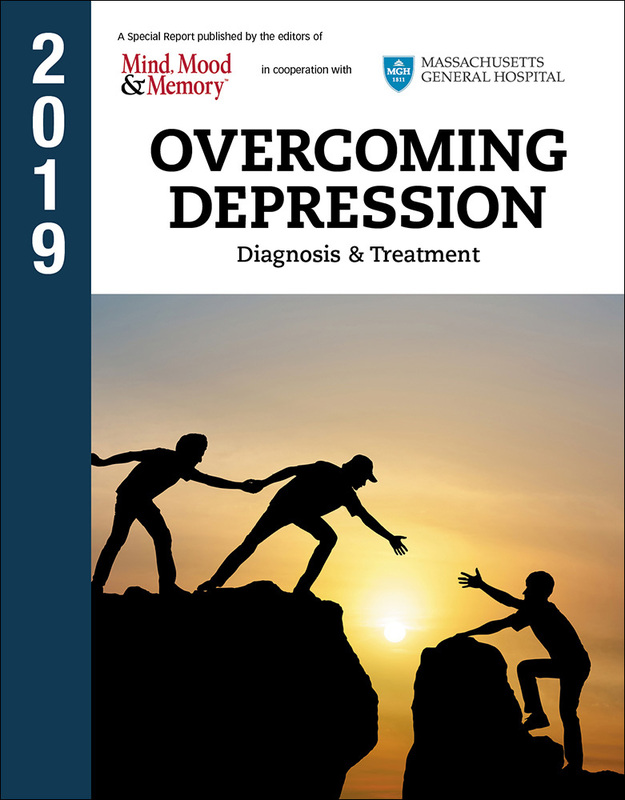 Get the authoritative 2019 report Overcoming Depression from Massachusetts General Hospital. Learn the early warning signs and symptoms to help prevent depression as well as the latest therapies and medications to lead you out of the gloom. You’ll be briefed on depression’s different forms and manifestations. Why do some sufferers become melancholy while others become manic? Why do some people experience mood swings in winter but others any time of year? Importantly, if you know someone prone to depression, you’ll learn to recognize symptoms that call for vigilance and those that warrant life-saving intervention. Don’t let your happiness be held hostage! It is estimated that 50% of all Americans diagnosed with depression don’t seek the treatment they need. Don’t let that be you or a loved one. For, although depression is often characterized by feelings of helplessness, the fact is, as never before, there is help. You can take heart. Even more than that, you can take action. You can take decisive and positive steps that will lead you out of the gloom. And this report will show you how. Say good-bye—and good riddance—to the sadness of depression! Overcoming Depression: Diagnosis and Treatments takes you to the forefront of advances that are helping depression sufferers get their lives back. You will get the facts you need to work with your doctor to formulate an appropriate treatment strategy tailored to your condition and concerns. The report explains, in understandable terms, the differences, benefits, and potential side-effects of the leading antidepressant medications. When is Zoloft a better choice than Cymbalta? Which antidepressant should be considered for individuals suffering insomnia? Which drugs are least likely to cause sexual problems? Which is the only antidepressant approved for use in children? What foods should you avoid if you’re taking an MAOI such as Nardil? This report will tell you. Plus, you’ll get straight talk about psychotherapy and its important role in treatment. You’ll explore therapies that are useful in identifying the problems that are causing your depression…therapies that aim to restore a positive outlook…and therapies that can help you work through your most painful memories. Plus, ways to bolster your mind and body’s defenses against the risk of depression. Preventing depression is not about putting on a happy face. (In fact, it can be far healthier to release your emotions.) But there are healthy lifestyle choices you can make to reduce the risk of depression or ward off its recurrence. The Report will share with you the components of a depression-fighting diet (with specific food recommendations)…the role of exercise and sleep…effective stress-busting techniques and more. Order the new edition of Overcoming Depression today! Overcoming Depression is available now at the lowest price ever! A very small price for information that can impact your health in so many ways. After you receive the book, review and learn from it. If, within 30 days, you are not 100% satisfied with the information in the report, call, write or email us and we’ll gladly refund you your full payment. And to ensure that you stay on top of important findings as doctors and researchers continue to study depression and ways the mind works, we will reserve future annual editions for you on a priority basis and at our lowest price. We will notify you by postcard or email before the next edition is released and shipped to you. If you don’t wish to receive it, just return the card within 30 days. You will also be able to review each future issue before deciding to keep it.